A 20 metre container could accommodate approximately 2,000 cases of wine, a small cafe or your company’s next switchroom. Industrial sectors are taking advantage of this versatility, and containerised electrical switchrooms are becoming a common sight. Here, Nick Boughton, sales manager at Boulting Technology, explains why the answer to complex electrical projects isn’t always adapting the system to fit the space. Traditionally, systems integrators faced with a project would build the equipment in-house, transport it to site and spend time installing and testing it. Although this sounds like a relatively straightforward process, the reality is much more complex and there are plenty of opportunities for logistic difficulties to rear their ugly heads. Safe transport is always tricky, especially when your “passenger” weighs a few tonnes and remote locations can be difficult to reach, particularly when there are only dirt roads going your way. Once on site, the equipment itself – usually large power distribution boards or motor control centres (MCCs) - can be difficult to get to wherever the switchroom is tucked away. Additional health and safety measures also need to be taken if there are people working in the building. Fortunately, there is an easier way. By using an industrial container to host the switchroom and building all the equipment, lighting, cabling and HVAC into the room, companies can avoid most of these logistic headaches altogether. The project is always client-led and containerised switchrooms are highly customisable, which means the approach can reconcile even some of the toughest requirements in industry. The main advantage of containerisation is its controlled environment. It’s easier to plan, design, implement, test and especially maintain a containerised switchroom, as long as the right monitoring is in place. Temperature is one of the most complex things to manage in any switchroom, especially when the space doesn’t allow natural air flow. With a container, it’s easy to install the necessary HVAC equipment in the initial stage of the project, along with remote temperature monitoring and alarms, which allow control engineers to identify a deviation from the normal parameters long before it becomes a risk. For larger or more complex projects, the container approach also means better scalability, because as long as the client allows for some space next to the original container, it’s easy to get another one commissioned, designed and delivered. Overall, the time it takes to design and test a containerised switchroom is significantly shorter than a more traditional approach that fits a system to a room. It’s faster and easier for the client, contractor and any third parties to fit all the requirements in a separate, controlled environment that can be delivered to the site, plugged in and left to run. While it’s true that the capital cost of a containerised switchroom can be higher than a traditional system, this approach usually results in lower overall project costs, because it reduces testing and even building times significantly. The containerisation approach works particularly well for remote environments, such as substations located in the middle of nowhere. The reverse is also true. In busy locations or areas of high risk or high security, it’s much easier to fit and test a switchroom when it comes neatly wrapped up in a “box” that doesn’t need any unwrapping. 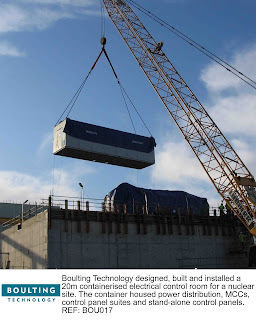 In nuclear projects, for example, where security, regulations and radiation can be significant hindrances for contractors a kitted out container is the easiest, fastest and most reliable bet. A recent project saw Boulting Technology design, build and install a 20m containerised electrical control room for a nuclear site. The container housed power distribution, MCCs, control panel suites and stand-alone control panels. Boulting Technology built the MCCs and control panels in its Warrington factory, integrated them into a prefabricated container at the company’s St Helens mechanical workshop and completed the electrical fit out, installation and testing even before the container reached the site. erall project timescale and logistic difficulties and they can be built exactly to the requirements of a client. Boulting Technology has yet to come across a project it couldn’t tackle, so if you’re stuck with a U-shaped switchroom with very small doors, don’t worry – a container switchroom might be just the thing you’re looking for. To find out more, get in touch with Boulting Technology on +44 1925 720 090 or visit the Boulting Technology website on www.boultingtechnology.co.uk.